This time of year, in this part of the world, it’s pretty hard not to hear about LeBron James. And so with the NBA playoffs in full swing – and with LeBron and his teammates headed to the finals for a stunning seventh year in a row – he gets quite a bit of press coverage. Is he fun to watch? Absolutely. He does things on a basketball court that sometimes don’t even seem physically possible. 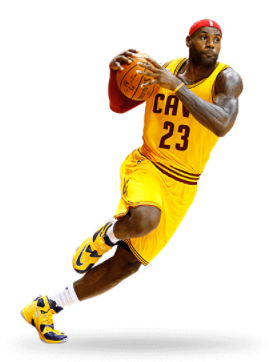 Can you, as a totally average basketball player, learn a lot from watching LeBron play? He’s 6’8″ and weighs 240 pounds. He’s incredibly strong. He’s a fantastic passer. He’s a fabulous defender. He can play any position on the court and can switch at a moment’s notice. Rumor has it that when he sweats he smells like freshly baked cookies on a spring day. And so when you watch him, while you’ll most certainly be entertained, there’s not a lot you can take from his game and apply to your own. Instead, and from a pure learning perspective, you’re much better off watching someone who resides further down the basketball food chain. Somebody very good, certainly. But somebody who relies less on superhuman natural ability and more on conventional skills put to good use. I was talking to a colleague the other day about her 30-person sales force. As you might expect, she has one person who consistently sits on top of the heap – month after month, he outperforms everyone else. Not because super-sales-guy isn’t legitimately super. Rather, because as the perennial leader, there’s a very good chance that much of what keeps him in the top spot – creativity, natural charisma, unusual intelligence, you name it – is neither teachable nor transferable. He’s LeBron James. Instead, and for the purposes of improving the team overall, I suggested she focus in on – and try to learn from – whomever is sitting at position #5. Is #5 salesperson above average? Definitely. Is #5 salesperson superhuman? Probably not. There are superstars in every profession; yours is no exception. And as an eager beaver (or whatever), you’re paying close attention to the best “players,” hoping to grab some insights. That’s fine, it certainly won’t cause any harm. I just don’t think it’s the best use of your time. Most of what’s put them so far out in front of the pack are talents, abilities – maybe even luck – that you probably don’t have. Here as well, little of it is teachable or transferable. Instead, I recommend paying attention to and learning from the above average performers in your world. The people who, while certainly doing well, are not once-in-a-generation gifted. I don’t believe you (send me a photo). What’s the best insight you’ve gained by watching somebody else in your field or industry? In journalism, studying and talking with above-average writers taught me four ways to open a story so that I stir curiosity and pull the reader in. And watching and talking with excellent presenters taught me 1) how to move on a stage to stay connected with the audience, and 2) how to create visually attractive slides (a work in progress). Those are great examples, Ken! And I’m with you on the “visually attractive slides” challenge. Never easy. 1. No, but I’ve always wished I could! 3. Be accessible. I’ve been amazed how “above average” people answer emails and agree to phone chats. It’s wonderful and a great example. 3. I almost didn’t respond, but I wanted you to think I was above average too. 3. Always say what you know, avoid guessing at what you don’t know. That’s a nice mantra, Mark! 2. me today: Thx 4 asking I’m gonna find one and share! 4. bonus point: You slam-dunked it, again! Uros! I’m eagerly awaiting your photo!! They ought to have a trash-can basketball league! Hope you are able to join the solo ranks soon, Jeremiah!